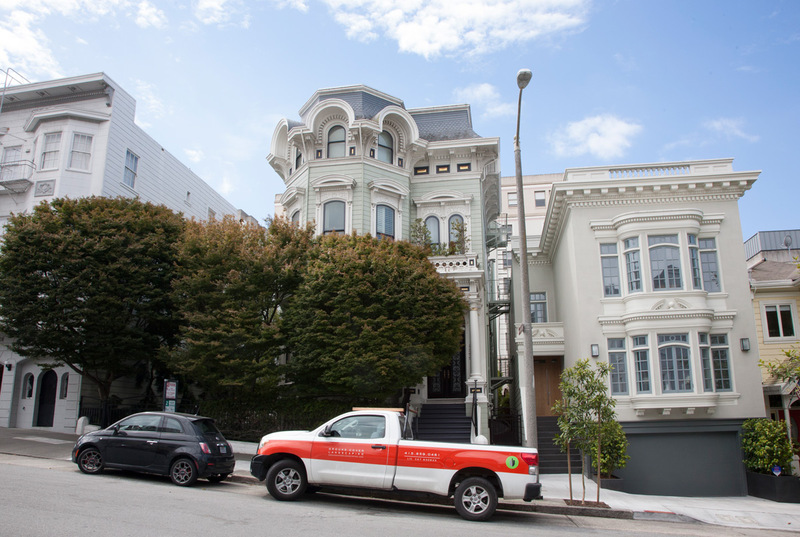 The home at 2355 Washington was moved from its original location near Union Square. 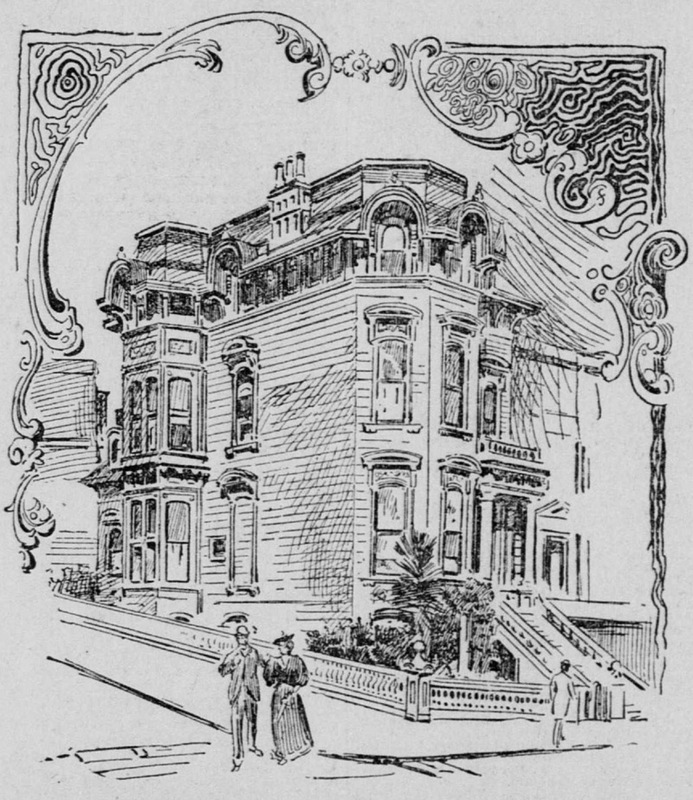 “The large frame dwelling which for so many years stood at the northeast corner of Sutter and Mason Streets has been removed to the south side of Washington between Buchanan and Webster, where it is being remodeled and improved by Dr. Merritt, daughter of the late Adolph Sutro.” So reported the Chronicle on July 7, 1900. That handsome residence now sits at 2355 Washington Street. Constructed around 1870, the house changed hands at least one other time before coming into the possession of Emma Sutro Merritt and her husband, George Washington Merritt, who was also a doctor. 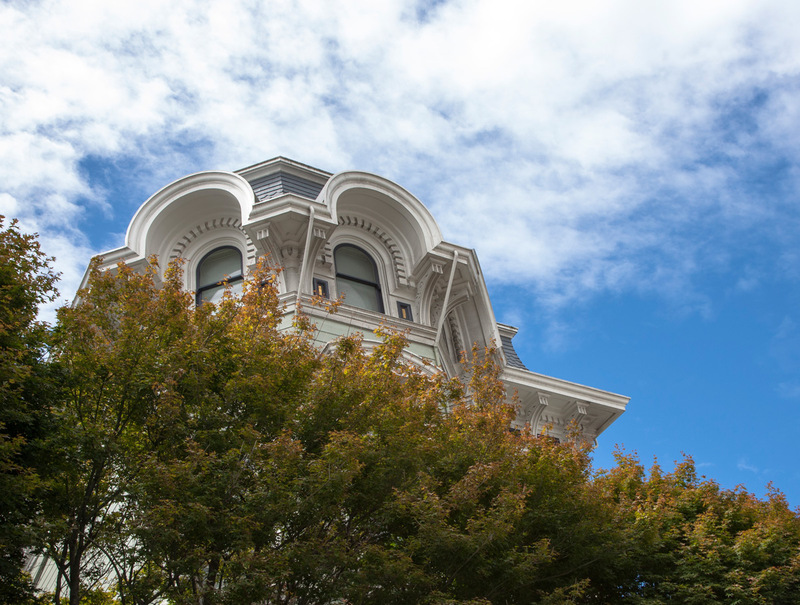 The wood-frame, Italianate and Second Empire influenced house with an unusual mansard roof originally sat a few blocks below the apex of Nob Hill. Remarkably, the house is visible in Eadweard Muybridge’s famous April 1878 multi-panel, 360-degree panorama of San Francisco, taken from the tower of the Mark Hopkins mansion on Nob Hill. Looking down Mason Street toward Sutter Street, the distinctive mansard roof of the house can be seen near the large Congregation Church that stood at the corner of Post and Mason, also easily visible in Muybridge’s photograph. R. B. Dallam, for whom the house was originally built, was a wealthy manufacturer and co-owner of Armes & Dallam, purveyors of wood and willow ware, brooms, twines, baskets, brushes, paper bags and other wooden household items. He came to California as a ’49er. In 1857, Dallam’s sister married George W. Armes, who had developed the Armes’ Star Extra Broom. Entering into business with his brother-in-law, Dallam purchased or built the house at 528 Sutter Street around 1870. By 1876, the firm moved its manufacturing operations to San Quentin to take advantage of inmate labor. The Dallams subsequently sold their San Francisco home and moved to Oakland. The home originally stood at Sutter and Mason. A successful miner and builder of quartz mills, Alsop Joseph (A. J.) Holmes purchased the home from the Dallams for $30,000 — then a sizeable sum — indicating the house remained very much in fashion. Holmes had made his fortune from the Northern Belle Mine near Esmeralda, Nevada. The 1880 census lists the 58-year-old Holmes; his 22-year-old wife, Addie; their daughter, Belle (likely named after the mine); an infant son; Holmes’ mother and a nephew — all residing in the house at 528 Sutter Street. By 1894, things had changed. A San Francisco Call headline proclaimed on October 30 of that year: “Died a Pauper: A. J. Holmes, Millionaire Mine Operator. His Strange Life Story.” A lengthy article highlighted the sensational rise and fall of one of California’s wealthiest miners. It included a sketch of his beloved Sutter Street home with the mansard roof. Holmes had sold the house to the Merritts around 1888. He died in the City and County Almshouse. Emma Sutro Merritt was the daughter of Adolph Sutro, San Francisco’s 24th mayor. Having made his fortune as the builder of an ingenious tunnel that drained the Nevada Comstock mines, Sutro “retired” to San Francisco, where he acquired property, assembled what became the country’s fourth largest library and built a private estate and gardens as well as the public Sutro Baths overlooking the Pacific Ocean. His oldest daughter, Emma, a Vassar graduate, returned to San Francisco and, despite strenuous objections from her father, entered medical school at the University of San Francisco. There she met her future husband, George Washington Merritt. After spending time in Paris at the Ecole des Medicin, the couple was married in London in 1883. Particularly focused on the well-being of children, she served as staff physician at Children’s Hospital for 20 years. She was also an active proponent of women’s rights and suffrage, and promoted opportunities for women in higher education. The Merritts settled into their new residence, still at the corner of Sutter and Mason, and both also established offices in the house. After several years, however, they determined that the area around Union Square was becoming increasingly commercial. They appreciated the architecture of the house and decided to move it to a more desirable residential area just a block off Lafayette Square. The census taken on June 2, 1900, recorded that the Merritts were residing in a rented flat at 1301 Van Ness at Sutter. They must have needed temporary quarters while their house was moved across town. House and building moving was popular in San Francisco from the 1870s and continued after the 1906 earthquake and fire. Numerous companies specialized in moving buildings, with almost 20 house movers listed in the 1900 city directory. The Merritt’s Sutter Street house would certainly have perished in the 1906 earthquake had they not moved it to Washington Street. Around 1915, the Merritts moved to Sutro Heights, the Sutro family estate. George died in 1928; Emma died 10 years later. The house at 2355 Washington was recently renovated and returned to single family use after having been converted into seven apartments in the 1940s, then to three apartments in the mid-1980s.